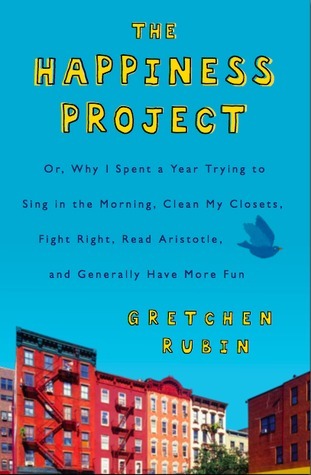 So I just finished The Happiness Project by Gretchen Rubin and I simply had to write a blog post about it. I’m considering doing this more frequently so please feel free to chime in and tell me if you love it or hate it. Also, my friend Sarah is considering starting a blog about movie / tv / book reviews and I’m really encouraging her to start. She’s offered to help me on my To Do list item of “Watch 5 Classic Movies I’ve Never Seen.” She’s got a biiiiiigggg crush of Steve McQueen, but first up I want us to have a movie day of Audrey Hepburn movies. I’m getting off topic though (side note: the ability to get off topic is literally one of my favorite things about writing this blog. I’m allowed to get off topic! It’s my blog and I’m not getting graded by a professor or critiqued by my boss… MINE ALL MINE!) I digress. The Happiness Project started as an idea, became a blog, then a book, and now it’s KIND OF a big deal. She also wrote a follow up book called “Happier at Home,” which I am considering reading in the future as well. I read the book because it was the Peanut Butter Fingers November Book Club selection. I obviously missed the write up by a couple days, but that’s ok. (I started the December Book “What Alice Forgot” on the metro this morning so I am determined to link up for that one!) Here’s a link to her write up / link up. Rubin is so accessible and easy to relate to. I fundamentally don’t connect with her on so many levels (she’s married, has two children, and has had two very successful careers already), but I felt like she was talking about me the whole time. Probably the number one thing that stuck with me about the book was when she was discussing the nature of happiness and unhappiness. She argued that happiness and unhappiness were not two sides of one emotion, they were separate and independent ideas. That… blew my mind. Whenever I’m feel unhappy about some aspect of my life, people always say “But think about X, Y, Z, those are such good parts of your life!” And while I appreciate the sentiment of focusing on the positive, all those comment did were make me feel guilty and ungrateful. Rubin argues that happiness is not just doing things that make you feel good, but also reducing things that make you feel bad. That was a huge revelation for me and made me feel so much less guilt! One of my favorite sayings that she quoted throughout the book (originally by G. K. Chesterton) was “It’s easy to be heavy, hard to be light.” I realized that the reason I tend towards getting sad or negative is because it’s EASY. It’s really hard to be happy, jolly and careful because life is hard. It’s not going to happen unless I work at it every day. The first chapter (January) focused on the idea of energy, and I took a ton of really useful tips from this chapter. While I already exercise and eat well, I was particularly interested in her ideas about little, nagging tasks. She employed the “one minute rule” (I referenced this earlier in the blog! ), where she would never put off a task that takes less than a minute to complete. Now I’m totally doing that. When I come home from work, I empty my bag, put my lunch containers in the dishwasher, and hang up my coat. Done deal. She also employed the “evening tidy up” which has been clutch. I wake up every morning to order and cleanliness… I love it. She also talked about the satisfaction of completing a “nagging tasks”. I am so guilty of this it’s not even funny. This week I registered my car in VA after putting it off and whining about it for 2 whole months. I have never felt such relief. It inspired me too! I cleaned out my sock drawer (only matched pairs with functioning elastic now!) and completed a bunch of long term projects at work. Another take away that I loved was one of her “Secrets of Adulthood”… Don’t like Perfect be the Enemy of Good. Woah… I mean that is me right there. I am unfortunately a really “all or nothing” person, and I’ve been trying so hard to moderate myself in so many ways. This saying is the perfect mantra to repeat to myself when considering a task. I have 20 minutes to squeeze in a strength training workout and I think “that’s not enough time to get a good enough workout”… Don’t let perfect be the enemy of good. I haven’t talked to a friend in a while and I want to catch up with them, but don’t have the time to compose a long email or spend an hour on the phone. I think about gchatting them or dropping them a quick note but am afraid that’s not enough… don’t let perfect be the enemy of good. Love it. She wrote a whole chapter (July) on Money, which basically could’ve been written for this blog. The biggest take away for me though was the idea of spending wisely. And not spending wisely like not buying crap you don’t need or can’t afford. Spending wisely like setting yourself up for happiness and success by spending money on the things you need or are important to you. I tend to put off buying things, even when I know that I need them, because I don’t want to spend the money. But in the long run that really adds annoyance to my day. For example, I only put $20 on my SmarTrip card (it’s DC metro / bus fare card in case you didn’t know) at a time, even though I take the metro every day and run out of money all the time. I invariably am out of money on a morning when I am running late and need to catch a train immediately. Why wouldn’t I just put the total amount I need for the month on at once?? That would save me so much hassle. I took a good hard look at how I think about money too, and I had a lot of really positive revelations. Hooray. I could go on and on and on for days, but I’ll just say that I really encourage you to think about reading it! My best friend put it on her Christmas List and I think Mike might even want to read it! My mom is always a big proponent of thinking about “joy” as opposed to “happiness” because happiness can be situational And I really do agree with that. But what I really enjoyed about this book was the argument that situational, every day happiness can be just as important. The things that bring me joy in my life are my family, Mike, my friends, the cats, etc. Those things make my life. But I also get really happy by the sight of a clean bathtub or a sweaty yoga practice. I realized that by focusing on the little things, it helped me see and enjoy the big things more. Also, more than one person in my life has told me they’ve noticed a real change in my mood. They said that I just generally seem happier… and that can’t be a bad thing 🙂 D0n’t I look HAPPY??? Also… Happy Friday!! Another inspiring blog – I am taking your advice because no matter what our “season” in life, we all need to be intentional about making each day really count!